SPOKANE, WA - The Spokane Empire put themselves in the driver's seat with a 48-43 win over the Colorado Crush in week 15. Heading into the weekend, the Empire had dropped three straight and fell into third place in the Intense Conference playoff race. 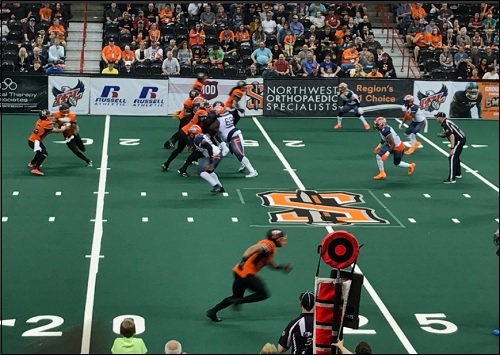 They are certain to move back into one of the two playoff spots in the conference as the Arizona Rattlers and Nebraska Danger face off this weekend. Should the Rattlers win, they will maintain a one-game lead over the Empire and the Danger would be a game back of the Empire for the number one spot. Should the Danger win, all three teams would be deadlocked at 8-5. The Danger already hold the tiebreaker over the Empire with a win in their only matchup of the season. The tiebreaker between the Empire and Rattlers will be decided next week when the two face off in Spokane. Spokane jumped out to a 14-0 first quarter lead on a two-yard run from Aaron Wilmer, and an 11-yard pass from Wilmer to Bryan Pray. The Crush came right back with a 25-yard pass from Sean Goldrich to Kyle Kaiser, and a 49-yard fumble return by Azziz Higgins. The game went into the second quarter tied, 14-14. Andrew Pierce scored on a five-yard pass from Wilmer to start a wild second quarter, Wilmer added a one-yard run to make it 28-14 with 4:29 to go in the second quarter. A pair of Miles Bergner field goals sandwiched a six-yard pass from Wilmer to Pierce, which put the Empire up 35-20 at halftime. Bergner was filling in for Spencer Groner, one of the better kickers in the IFL. His 53-yard field goal was the second-longest in the IFL this season -- next to Groner's kick of 56 yards earlier this season. His 22-yard field goal with 9:46 to go in the third quarter drew the Crush to within 12 points. The Empire's Brendon Garcia countered with a 21-yard field goal before Liam Nadler, inserted for Goldrich bulled his way 10 yard into the end zone. The Empire went up 35-21 on the last play of the third quarter with Trevor Kennedy's one-yard touchdown run. Garcia put the Empire up 38-21 with a 27-yard field goal to open the fourth quarter. Within the last five minutes, the Crush attempted a comeback, with Nadler finding Kyle Kaiser on scoring passes of 2 and 15 yards. The Crush attempted an onside kick, which was recovered by the Empire, who were able to run out the clock. The Empire had 220 total yards of offense, compared to the Crush's 184, and the Empire had 101 rushing yards. Colorado was flagged 11 times for 89 yards, while Spokane committed four penalties for 53 yards. A concerning moment came late in the third quarter when Empire wide receiver Samuel Charles was attempting to catch a touchdown pass over the dasher board and landed out of the field of play on to the concrete. Charles was shaken up and attended to, stopping play for several minutes. He was eventually able to walk to the locker room under his own power. Wilmer was spectacular in his first start for the Empire, completing 17 of his 23 passes for 119 yards and three touchdowns. He also ran 18 times for 61 yards and two scores. Pierce rushed eight times for 37 yards. He caught six passes for 38 yards and two scores. Bryan Pray had five receptions for 58 yards and a touchdown. Trevor Kennedy caught four pases for 18 yards, and scored on a rushing touchdown. John Hardy-Tuliau led the Empire with five total tackles and four pass breakups. Andrew Jackson had an interception, and John Griggs registered a sack. Goldrich went five of 13 for 76 yards with a touchdown and an interception. Nadler was nine of 16 for 65 yards and two touchdowns. He also had a rushing touchdown. Kyle Kaiser was a standout for the Crush in this one. He had seven 68 yards and three touchdowns, Lovie Rose III caught three passes for 36 yards, while Antonio Jones Jr. grabbed three passes for 28 yards. Cardelro Jones led the Crush with 7.5 total tackles, and Daniel Lindsey had six total tackles. The Empire (8-5) will host the Arizona Rattlers (8-4 heading into week 15) on June 3 at 7 p.m. The Crush (3-10) will host the Sioux Falls Storm (11-1 heading into week 15) on June 3 at 4 p.m. All times are pacific time.